The Timex Black Grip Clip Digital Watch #T73751 makes a cool gift idea for the person who likes to know the time but isn't into wearing a watch on his (or her) wrist. 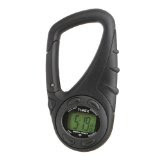 This clip watch can snap onto backpacks and belts or slip into a pocket and provides access to a variety of functions. It is also water resistant to 165 feet. Click here>> for more information and product details on the Timex Black Grip Clip Digital Watch #T73751; as a gift or for yourself!